Are you best friends with someone? A best friend is wonderful to have. Someone to play with, tell secrets, stand by your side, and love you no matter what. David had an incredible friend. King Saul’s son, Jonathan, was one such person. Earlier, I told you David was anointed king long before he sat on the throne. David needed to learn lessons from the Lord first. The younger David had been a wonderful shepherd. King Saul promoted David from armor bearer to a soldier in the army. This made the people happy because they loved David. David’s abilities and faith in the Lord made an impression on the people and Saul. After promoting David, Saul became jealous of David, after all, he killed a giant and his faith was far superior to Saul’s. Story of David and Goliath King Saul wanted David gone from his life in fact, he desires him dead. Isn’t that terrible? 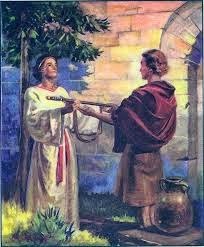 Jonathan asked to be David’s friend and gave him presents of: his robe off his back (like a coat), tunic or shirt, his belt, sword, and bow. These tokens of friendship were precious to Jonathan. A man uses these things for protection. One day, David came to Jonathan and asked him why his father was so angry with him. Jonathan didn’t want to believe his father wanted to destroy David. He devised a plan. The plan was for David to miss an important banquet in the palace with the King and his important officials. In the plan, David would hide in a field and Jonathan would attend the banquet. At the banquet, Jonathan would see for himself if his father wanted to hurt or even kill David. Saul’s attitude toward David came out when he inquired after David. Jonathan told his father that David had somewhere else to go. Saul’s anger flared and Jonathan got the brunt of it. His own father threw a spear at Jonathan. Jonathan escaped and came to the field where David was hiding out. The rest of the plan was for Jonathan to come to the field and shoot an arrow. If he shot the arrow close to himself, David was safe from Saul’s wrath. But if he shot the arrow far toward David, then David would not be safe from Saul. Jonathan took his bow and his helper out into the field. 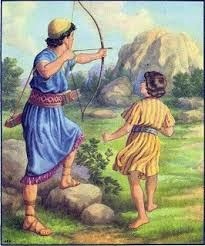 The boy returned with the arrow and Jonathan gave him his bow and sent him back to town. The boy knew nothing of what had happened. When the lad had gone, David got up from his hiding place and bowed toward Jonathan. They hugged and wept because they realized David needed to run away from Saul, his life depended on it. They were not sure when, or if, they would see each other again. David departed and Jonathan went home. They kept the covenant to protect and love each other throughout their lives. Jonathan was a true friend. He put his friend’s life before his own. He didn’t know how his father would act toward him after that day. Are you a true friend? Do you place your friend’s needs before your own? I hope so.